AS STANDARD ALL OUR CHARTERS INCLUDE: --Fixed price --No hidden extras --Personal captain for the day --Fuel & taxes --Water & soft drinks --On-board towels & robes --Hero 5 GoPro for the day --Bottle of Veuve Clicquot Champagne --Paddleboarding & snorkelling We also understand that not everyone wants the same thing, so we welcome our guests to add on any extras to cater for your party’s needs. Whether you are looking to visit an attraction, water sport sessions, spa services, event tickets or simply just want to upgrade your inclusions for a special occasion. We are also proud to offer a new dimension for businesses with our fully inclusive bespoke corporate packages. Take a look at our website news page to read about one of our recent on-board proposals. She Said Yes! CHARTER PACKAGES CUSTOMISE YOUR RIVIERA: This package is perfect for those who just want to sit back with a glass of Vueve Clicquot Champagne and enjoy the ride in the Cote d’Azur sun on an itinerary of your choice. HIGHLIGHTS: Choose your own itinerary. Quote will be provided based on the itinerary chosen. JEWELS OF THE COTE D'AZUR: Perfect for those that want to experience the French Riviera in all its beauty. From the glitz and glam of Monaco, to the romantic fishing village of Villefranche and the unspoilt natural charm of Saint-Jean-Cap-Ferrat. HIGHLIGHTS: Visiting Monaco, Villefranche and Saint-Jean-Cap-Ferrat. CANNES AND THE ILES DE LERINS: Perfect for those looking to explore Cannes, one of the French Riviera’s hottest celebrity destinations, followed by an afternoon of yacht relaxation and natural beauty on the Iles de Lerins. HIGHLIGHTS: Visiting Cannes, the Iles de Lerins. THE MONTE CARLO CASINO ROYALE: Perfect for those looking for a mixture of shore exploring in the glamourous principality of Monaco, coastal cruising and fun in the water. HIGHLIGHTS: Visit Monaco, time cruising and fun in the water. CULTURE IN MONACO & MENTON: Perfect for those looking to immerse themselves in the glamour and culture of the French Riviera, whilst also enjoying the luxury of your own yacht. HIGHLIGHTS: Visiting Monaco and Menton. SUNNING IN ST TROPEZ: Perfect for those looking to explore an elite hotspot of private beach clubs, fine dining and the unusual character of Port Grimaud. HIGHLIGHTS: Visiting St Tropez and Port Grimaud. OUR YACHT Being a British company, our Astondoa 46 named Life of Riley flies a British Red Ensign flag and holds a registration of Manchester, UK. Built using state of the art lamination processes, she offers a smooth and stable ride while boasting an elegant and modern design. Her large sun pad area on the forward deck is perfect for those looking to soak up the Cote d'Azur sun, while her fly deck offers a great space for groups to enjoy refreshments under her canopy. For those that would prefer an indoor seat, her open plan galley has ample seating surrounding a table. FRENCH RIVIERA While there is no official boundary, the French Riviera spreads from the border with the Italian Riviera in the east, to Cassis in the west. Boasting a beautiful landscape, glamorous reputation and mild climate, it is no surprise luxury yacht charters here are so popular. With such a dynamic choice of destinations, your experience with us is endless! Walk the footsteps of Hollywood movie stars along the palm-lined Cannes Croisette, dine at trendy beach clubs in St Tropez, take a stroll along the Promenade des Anglais or head to the famous Monte Carlo Casino. For those looking to step off the beaten track, admire the natural beauty of the Lerins Islands and Esterel Mountains. This coast is also home to some of the most charming seaside towns scattered with grand estates, such as Villefranche and Saint-Jean-Cap-Ferrat. DISCLAIMER: Charter prices will vary on event days. example: Monaco Grand Prix ect. 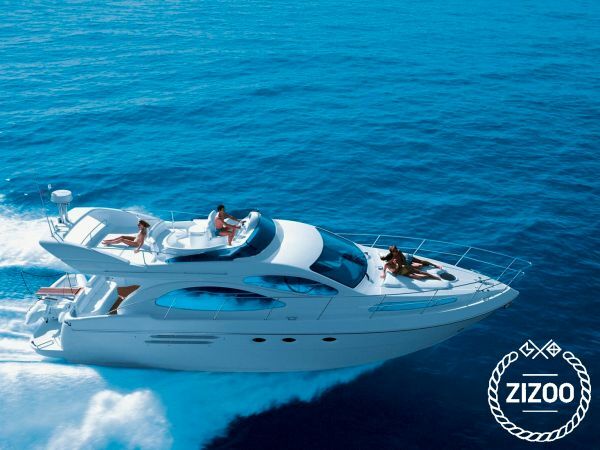 A yacht charter in France with Zizoo grants you access to one of the world’s most renowned and scenic cruising grounds. France also boasts world-class facilities for sailors and a range of stunning scenery along the coastline, from lush, green islands to the gorgeous sun-drenched beaches of the south. Requested 71 times this week!